Enjoy a spa-quality facial at home or on-the-go with this quick and easy set. Chances are you know more than a few super moms who deserve some extra me-time. Encourage them to treat themselves with this quick and easy facial set. 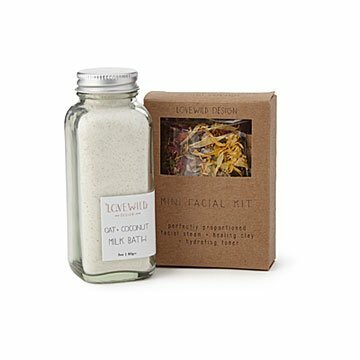 This floral facial steam, peppermint toner, and French green clay mask are all simple to use, and made from ingredients ladies who err toward au naturale can feel great about. The neat and compact packaging make this a must for travelers, too—just the right size to slip into a carry-on for refreshing while on vacay. Jet-setting mamas, take note. Handmade in Brooklyn. glass, dried flowers, cork, kraft paper, French Green clay, organic peppermint toner, milk bath, fabric bag.